What do you love the most about the Automotive Technology Program at SIU? The Automotive Technology Program at SIU is an environment where creativity and deeper understanding is fostered. The program has also made many connections with different companies to give students more ideas about various career paths that might otherwise be unavailable or unknown to most students. How has the Automotive Technology Program prepared you for what you do? The Automotive Technology Program was a part of my preparation to teach in a secondary education environment. The skills that I acquired during my time at SIU not only gave me knowledge of vehicle systems, but it also prepared me for the challenges that I might face in a corporate environment. The program also gave me a deeper insight into vehicle dynamics and diagnostics that I would not have received in another program. Give us a snap shot of what you do everyday. 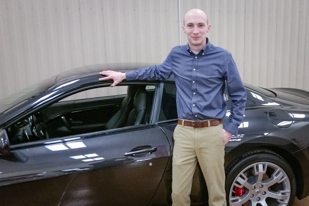 After working as a Chrysler Instructor in Houston, TX for 3 years, I was asked to move over to Maserati. I conduct factory training to dealership technicians from all over the United States and Canada. Most technicians have experience with Ferrari, Lamborghini, Porsche, Bentley, Bugatti, and other high end brands. I am responsible for dealership training progress for the central part of the United States. I also travel to Italy a few times a year to attend training sessions on new products or courses. Any advice for current and future students? Never be afraid to stand out from the crowd. Unique individuals are the ones that make a mark that others remember. Volunteer for every job or project, regardless of the recognition it might bring, and never pass up and opportunity to work on something outside of your skill area. Finally, remember that the limitation to the skills you acquire are only restricted by your desire to use them. I went to SIU to become a high school automotive teacher, which would have had its career limitations. Never in my wildest dreams would I have thought that I would be teaching a high end luxury brand to some of the greatest technicians in the world.